August is the gateway to fall, but it certainly doesn’t feel like it with its typical hot, humid, and dry weather. July of 2018 was a surprisingly mild and wet month this year, and what lies ahead for us in August remains a mystery. Will the trend of rainy, warm weather continue, or will we see a more typical August of dry weather and hot, humid temperatures? Only time will tell. 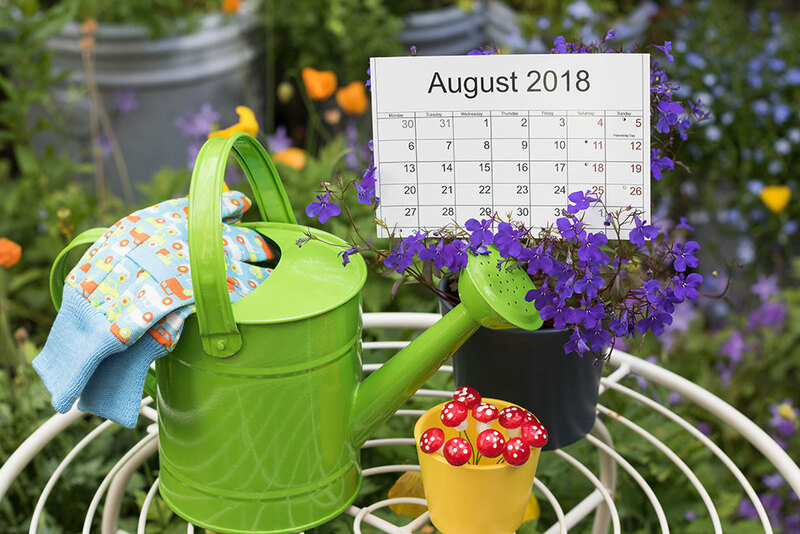 Regardless of the weather conditions, there are five key things that every gardener should add to their August worklist to get the best head start for their fall gardening. August is the best time to begin planning your fall flowering gardens. Take some time to inspect and evaluate your garden setups. Are there areas that are colorful and showy in spring and summer but then dwindle to dull green foliage in the fall? These beds would be perfect for a few fall additions of color. If you plan on using seeds from a seed catalog, now is the best time to start sowing cool weather annuals like pansies, violas, and snapdragons. Not patient enough to do seeds? No problem! We’ll carry a vast supply of garden mums, asters, ornamental cabbage and kale, pansies (weather permitting), and other fall-flowering annuals towards the end of August. Until then, get your garden beds ready now by cleaning out weeds and pruning back existing, overgrown plants. Begin your preparations now for a cool-season vegetable garden. Pull out failing or under-performing summer vegetables to make room for new additions. Your spring and summer vegetables take up a lot from your soil and can leave it depleted of valuable nutrients needed by your new fall crops. Be sure to amend any soil with a fresh batch of rich compost such as Meadows Farms Compost Manure, Just Natural Garden Soil, or Black Kow Manure. A mixture of Espoma Biotone Starter Plus in the soil will help get roots established faster, leading to more productive crops. Meadows Farms will begin receiving all of your favorite cool season veggies like spinach, kale, swiss chard, broccoli, and more starting in the next few weeks. Dividing overgrown perennials is a perfect way to fill extra space in your garden without having to spend money on new plants. Division also encourages stronger root growth, leading to more productive plants in the seasons to come. Now is the perfect time to divide perennials like iris, peony, daylily, summer phlox, and other perennials coming to the end of their flowering seasons. The process of perennial division is simple. Start by gently lifting the plant out with a garden fork or spade, knocking any access soil away to expose the ball of roots. Then, with that same spade gently separate the roots down the middle so that you have two equal sections of the plant. From their, replant each piece where you want in the garden, using a good helping of Espoma Biotone Starter Plus in the soil to help root stimulation and growth. Water thoroughly after planting to set them off in the right direction. August can be a pain for the gardener regarding pests and diseases, so it’s essential to stay ahead to keep your lawn and gardens healthy going into the fall. As Japanese beetles begin to finish their assault of your garden above ground, their larvae (known as grubs) can do a number on your lawn roots below ground. Now is the perfect time to plan out and implement a grub control strategy using products such as Bayer Advanced Season Long Grub Control or Milk Spore. Spread them just like you would a lawn fertilizer and they’ll help to keep your lawn grub free this fall. Some gardeners come into the garden centers around this time complaining of a black, almost ‘sooty’ substance all over the leaves and stems of their hollies and other evergreen plants. Your initial reaction may be to think it’s a fungus, but think again! This substance is known as “sooty mold,” and it is a sure sign of a pest infestation, usually from aphids, scale, or mealybugs. This sooty substance comes from the secretions of the insects as they feed. Treatment with an insecticide will clear up the infestation, and the sooty mold will eventually wash off with time. The dry heat and high humidity of our typical August can breed outbreaks of powdery mildew on many of your plants. You can identify this mildew by the greyish-white powdery substance that appears on the leaves. It almost looks as if someone dropped talcum powder or powdered sugar all over your favorite plants. Over time, powdery mildew can stunt photosynthesis, leading to growth and performance problems for your plants. You can treat powdery mildew by pruning affected areas, cleaning any debris out from under the plants, and applying a multi-purpose fungicide to eliminate any remaining spores. The heat and humidity of a typical August can wreak havoc on your lawn. Be sure that your mowers are adjusted to cut no more than one-third of the height of your grass. This limits the damage the heat may cause. If you’re ambitious and want to get ahead on your lawn reconstruction for the fall, now is an excellent time to aerate. Aeration removes small clumps of soil from the soil, improving drainage and allowing water and nutrients to access turf roots. You can purchase various types of lawn aeration equipment, or you can hire a professional service like Meadows Farms Ground Maintenance to handle the task for you. Take care of these tasks, and you’ll be ready to tackle the challenges of the fall garden!